The trackage situation for S scale standard gauge is nowhere near as robust as in HO. That said, there is a spectrum of trackage products that should provide what you’re looking for. We’ll first look at S standard gauge products, then move on to cover S narrow-gauge trackage products. S scale has correct proportions, unlike a few other scales. 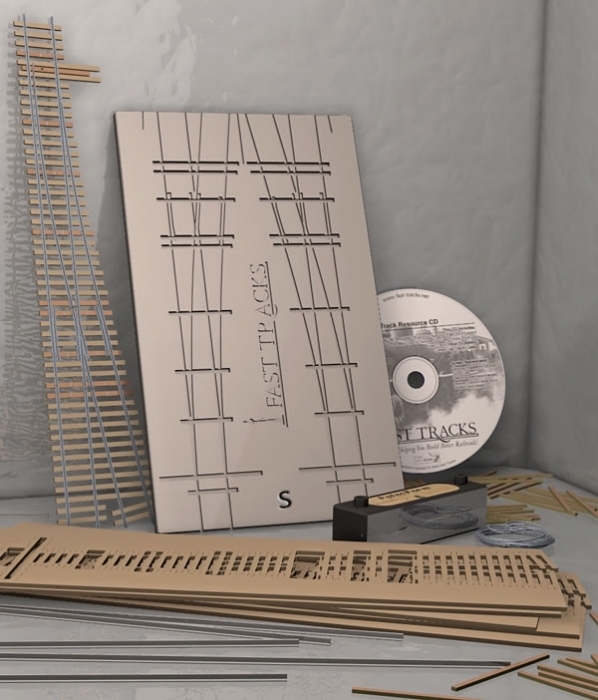 The standard-gauge track gauge (.833″) is actually a scale 4′-8 1/2″. Wheelsets having the correct thicknesses (.088″) are commercially available. All measurements are English, wherein 1/64 inch is equal to a scale inch. I purchased a dial caliper at my local hardware store that reads directly in integral 64ths of an inch; i.e., actual S scale inches. I’ll go through ready-to-run, then kits, and end with construction ideas for the trackwork nut. There are three primary sources of assembled standard-gauge track and turnouts for the S scale modeler: Tomalco Track, Shinohara (available only from “S”cenery Unlimited), and S-Helper Service (SHS). By “assembled,” I mean a turnout’s rail components are firmly affixed to a tie bed, properly gauged, ready to drop in place on your layout. S-Helper Service (SHS) makes meter-length heavy mainline flextrack in nominal code 125 (actually .131 inches) per Pennsylvania Railroad specs (152-pound rail, eight actual inches high.) (The reason for the extra .006 inches arises from the tolerance allowed by the SHS specification to the Chinese manufacturer, who chose the maximum.) However, SHS makes no turnouts or crossings that specifically mate with this track. SHS’s only turnout is a No. 3, made with the same .131-inch rail size. However, it comes mounted on a molded plastic ballast base. As such, it is not the same height as SHS’s flextrack, which has no ballast base, unless you lay your flextrack on roadbed that matches the turnout’s ballast base thickness. The turnout will match perfectly with SHS’s sectional track. Some scale modelers used SHS sectional track and turnouts. In order to offer one turnout design that will accommodate both hirail and scale wheelsets, SHS’s turnouts have a frog point that moves according to the direction for which the switch is thrown, thus providing a continuous railhead through the frog. These turnouts do not have guardrails, and they are not needed because of the frog design. They can be purchased for manual operation or already motorized, accompanied by wired control boxes. No other vendor offers a motorized S scale turnout. SHS’s matching sectional track comes in straight sections of several lengths, plus 20-inch, 25-inch, and 30-inch radii. Railway Engineering does not offer flextrack. However, they do offer ready-to-lay flextrack-compatible turnouts. Railway Engineering’s turnouts are covered below under the “kits” category, but for an extra fee, Railway Engineering will complete the turnouts for you. These have some PC-board ties to which the rails are soldered, thus assuring proper gauge. The rest of the ties are wood, already attached to the rails. Tomalco Track offers flextrack (manufactured for them by Micro Engineering) and a wide variety of turnouts and crossings in code 100, code 83, and code 70 rail sizes, with either weathered or unweathered rail. Tomalco’s flextrack tie bed features eight-foot ties with integral scale-size spikes and tie plates. It can be glued or spiked in place. Pilot holes need to be drilled into the ties in order to use spikes because the tie strip’s plastic cannot be penetrated by spike points. Tomalco makes its own crossings and turnouts. These are constructed of rail affixed to laser-cut wood tie beds with a thermoplastic cement, and they mate properly with Tomalco’s flextrack. Because of the cement, Tomalco turnouts are often a tad out of gauge, and if they’re not, they soon will be. They must all be checked. They can be restored to gauge by heating the railhead and moving it laterally so as to conform to the NMRA/NASG track gage. Once the rails cool, the turnout should be spiked down to prevent future glue creep. In this sense, one might suggest that Tomalco turnouts be placed in the “Kits” section. In addition to their catalogued turnouts and crossings, Tomalco will make any custom turnout and/or crossing configuration. Tomalco will also provide their turnouts “DCC-friendly” for the asking. These have insulated throwbars, closure rails grounded to their adjacent stock rails, and gaps in the closure rails adjacent to the frog. Shinohara flextrack, which is all code 100, has eight-foot ties with highly-visible molded wood grain, molded-in tie plates, and somewhat oversized spike heads. The modeler therefore has a choice of the less fragile rail-to-tiestrip bond of Shinohara versus the more scale-appearing Tomalco flex. Shinohara’s tie strip plastic is soft enough to allow spiking to your roadbed without the need to drill pilot holes. Shinohara turnouts are available in No. 6 and No. 8 sizes. Both are nominally consistent with the NMRA track gauge and flangeway standards. Additionally, the No. 8 matches NMRA dimensions, while the No. 6 is about an inch and a half too short. The No. 6 has a true No. 6 frog, but the curvature between points and frog approximates that of a No. 4½. Over time, the gauge of the Shinohara turnouts through the points will tend to narrow. This is because there is no lateral restraint of the stock rails in this vicinity. Also, the No. 8 turnout’s curved stock rail is curved adjacent to the points; it should be straight. For certain long-wheelbase trucks with metal wheels (like an Alco PA diesel), the backside of a wheel tends to complete a short circuit by rubbing against the backside of an open point. Both of these situations can be rectified by slightly kinking the curved stock rail about a sixteenth of an inch ahead of the tip of the point. Then, while using a finger to hold the rail straight adjacent to the point, apply a small drop of thin fast-setting cyanoacrylate glue (“super glue”) to the outside of the rail base on two or three ties. Once the glue seeps under the rail base and bonds it to the tie strip, you can remove your finger. In conclusion, S scale doesn’t have the variety of ready-to-run trackage products enjoyed by those in N, HO, and O. However, there is enough available to build a complete layout. In addition to the products mentioned herein, S also enjoys the availability of Fast Tracks turnout-construction jigs, which make it easy to build reliable turnouts on your own. Generally, the Railway Engineering turnouts should be the most trouble-free right out of the box. For small steam locos, four-wheel-truck diesels, and freight cars, the SHS and Shinohara products will give you little or no trouble. If you want to run passenger cars, diesels with three-axle trucks, and/or large steam locomotives, choose flextrack from Shinohara and/or Tomalco, and use Shinohara turnouts, preferably No. 8, if you don’t want to spike the rails. Even then you may have to do some tweaking as stated above. And if you’re not afraid of adjusting, regauging, and spiking, Tomalco turnouts may appeal to you. As of this writing (April 2012), there are no flextrack-compatible motorized turnouts in S, so you will have to provide a separate mechanism to throw your switchpoints. Common alternatives include Tortoises, Blue Points, Caboose Hobbies ground throws, and many other options, just as in HO and O. Railway Engineering offers ready-to-lay turnouts in codes 70, 83, and 100 rail. Sizes offered are No. 6, No. 8, wye, curved No. 8 and No. 12, plus No. 6 and wye stub turnouts. These turnouts come soldered to PC (printed-circuit-board) ties in key places so as to maintain gauge. Wood ties to fill in the rest of the tie spaces can be obtained for an extra charge. There is also a “DCC-friendly” option similar to that offered by Tomalco. There are other alternatives; I’ll call them “kits.” One such source is BK Enterprises, which offers its turnouts in code 125, code 100, and code 83. Sizes offered are Nos. 4, 5, 6, 8, 10, and 12, plus curved turnouts, wyes, three-way turnouts, stub turnouts, and double-slip switches. Crossings are available in several angles: 19, 30, 45, 60, and 90 degrees. All of BK’s turnouts are top-strapped (brass “keepers” soldered across the railheads) to approximate gauge. It’s up to the modeler to spike the turnout or crossing in place to proper gauge, then unsolder the straps, then clean any excess solder off the railheads. You need to have glued, sanded, and stained your turnout ties before installing these turnouts. BK also offers turnout kits (the complete turnout, but no straps); barer-bones point/closure-rails/frog assemblies, and frogs only. Fast Tracks doesn’t make turnouts, flextrack or crossings. But they do make jigs for these things. Their kits include a milled aluminum jig that holds your rail in place for soldering PC ties to the rail bases, point-filing jig, wood and PC ties, solder, rail for various turnout sizes and crossing angles, and instructions. Also available are flexible jigs for placing and spacing wood ties. The jigs are also available separately. Fast Tracks manufactures jigs for several sizes of turnouts, crossings, and three-way turnouts. Not all sizes are available all the time, so it’s best to check before ordering. Each jig provides for assembly of both a left and a right turnout, and the jigs will last pretty much forever. The jigs are pricey, but still, they will pay for themselves once you’ve constructed just four turnouts. I currently am hand-laying track on my “new” layout, but my previous layout used commercial track, including over fifty turnouts. I essentially used commercial track wherever possible, sometimes with modifications to turnouts to make them fit. This meant that there was some special trackwork on that layout that I had to hand-lay, including some dual gauge, special turnouts, and crossings. There are two primary manufacturers of 3-foot gauge track and turnouts for the Sn3 modeler: P-B-L and Shinohara. You may hear the name Tomalco mentioned, but P-B-L now owns the narrow gauge portion of the former Tomalco track line. “Tomalco Track” is a different company today, offering standard-gauge products only. Shinohara (available exclusively through “S”cenery Unlimited) makes nickel-silver Code 70 flextrack and Code 70 turnouts in the No. 6 size. The Shinohara flextrack has molded plastic ties with wood grain. The ties are 6’-6” long and have molded tie plates and almost scale spikes. It is the more flexible of the two brands of flextrack and its spikes are slightly larger than the P-B-L track. The flextrack comes in meter (39”) lengths. On the turnouts, the head block ties are the ties on either side of the turnout throwbar. The head block ties are only a standard tie length, so you will have to add an extension to these ties for a switch stand. In the past, I used some excess flextrack ties for this purpose after sanding off the spike detail. P-B-L (whose track products are made by Micro Engineering exclusively for them) offers Code 70 and Code 55 flextrack, with both plain nickel-silver and weathered nickel-silver rail. Their flextrack is 36” long. The ties are 6’-6” long molded plastic with wood grain and scale-sized spikes. They do not have tie-plate detail. 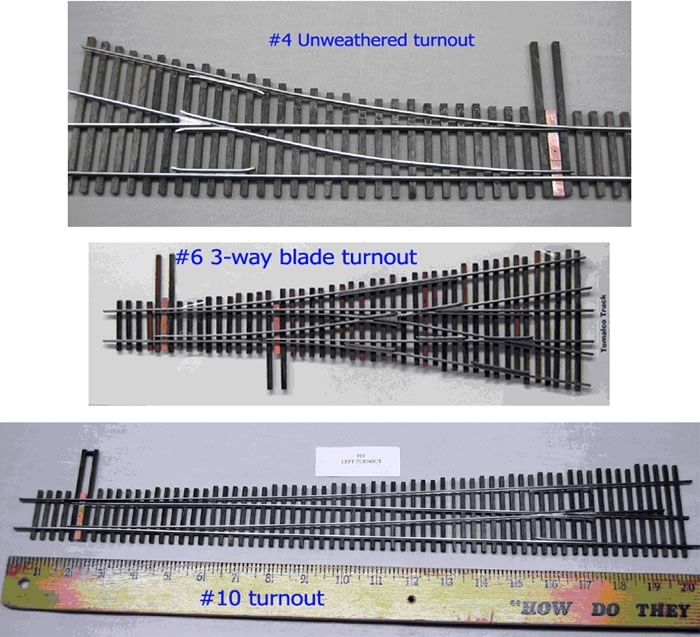 This is not a negative, because many narrow gauge railroads did not use tie plates. P-B-L also has Code 70 turnouts in the #6 size. These are only available with plain (unweathered) nickel-silver rail. The P-B-L turnouts have standard-size ties for the headblock ties, but they include two extensions that have a pin that can plug into slots on either side of the headblock ties to extend them for a switch stand. P-B-L also offers Code 55 stub switches in the #6 size, but only with weathered rail. 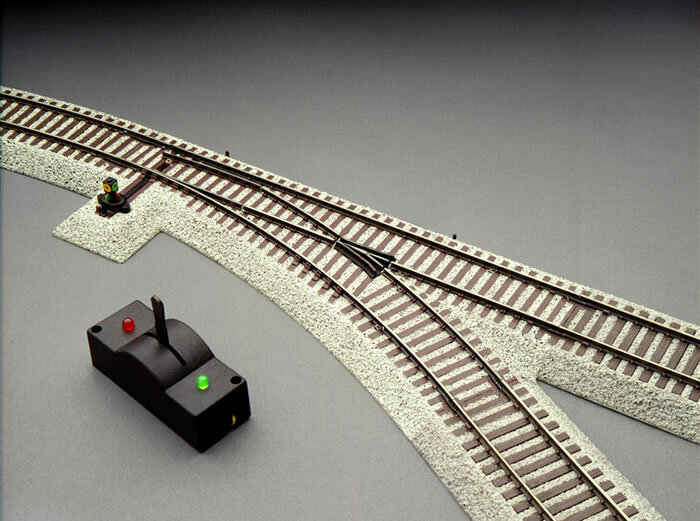 Stub switches, which require bending the lead rails to select the path rather than using points, cannot be made in one assembly to be laid on your own roadbed. Thus, there is a modest amount of work needed in addition to the normal wiring, and an instruction sheet is included with the turnout. There are left and right hand versions of the special headblock tie which includes a molded casting to hold the ends of the stock and closure rails. You must select which one to use based on which side your switchstand will be located. 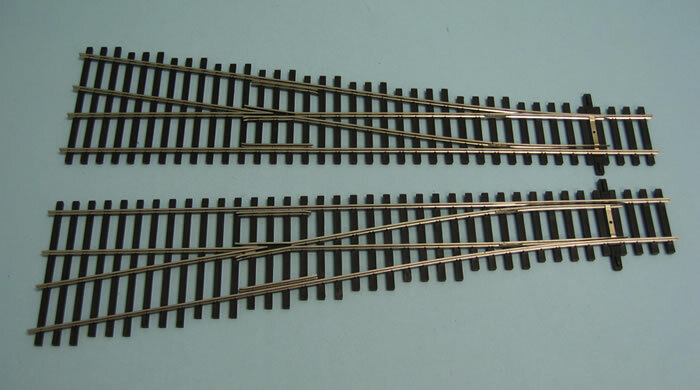 The lead rail portion includes four molded standard ties at one end with a throwbar at the other end and two bridle bars to keep the track in gauge in between. There are six standard ties to place under the lead rail portion between the fixed ties and the throwbar. Since the rails need to slide over these ties, they have wood grain detail only. It has been made about as simple as it could be for a stub switch, and to my knowledge, this type of product is unique to Sn3. Other scales only have the custom kit-type of stub turnouts. 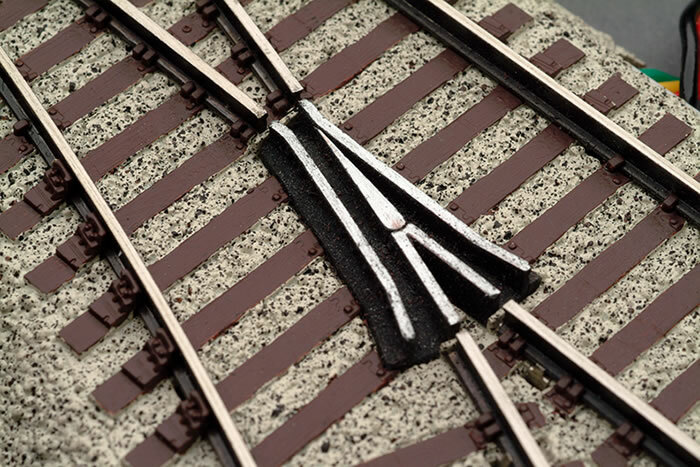 All the Sn3 commercial trackage products available require drilling the ties if you want to spike the track. There are no track spike holes like the track in some other scales/gauges. The commercial offerings are limited to Code 70 and 55 rail sizes and No. 6 turnouts. There are no commercial dual gauge S/Sn3 products. The custom track manufacturers will make dual gauge turnouts and other special trackwork, but you will have to hand-lay your plain three-rail track. That said, on my former layout, I did successfully glue a third rail on some standard gauge flextrack when I dual-gauged a former standard-gauge-only siding. There are no commercial Sn2 ready-to-run track products. But Sn2 uses the same track gauge and track standards as HOn3. So if you are totally averse to hand-laying track, you can use the HOn3 turnouts available from Micro-Engineering and Shinohara. You could also use their flextrack by spreading the ties farther apart, which greatly improves its appearance. To do this, you must cut all the webs between the ties that are under the rails, then slide the ties further apart. But there is a much better option. Portland Locomotive Works sells Sn2 plastic tie strip. All you have to do is slide code 55 rail into it and you have Sn2 flextrack! Unfortunately, if you want ready-to-lay turnouts, you’re stuck with the HOn3 ties on the turnouts unless you want to discard the ties entirely and re-lay (spike) the turnout to the proper-sized Sn2 switch ties. There are some custom trackwork manufacturers that do work in Sn2. These include BK Enterprises, Light Iron Turnout Company, and Railway Engineering. These are essentially kits, similar to the descriptions of BK and Railway Engineering products described in the “standard gauge” section above. Another option is Fast Tracks, which manufactures jigs and other Sn2 products. Sn2 ties are available from Kappler as a standard item, and on an occasional batch basis from Mr. Albert. Light Iron Turnout Company uses using Fast Tracks jigs to fabricate their turnouts.